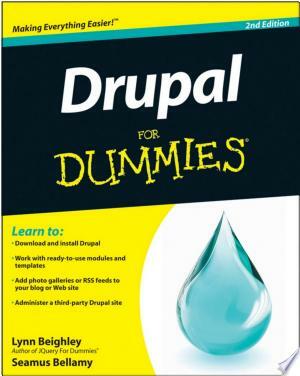 Learn to set up, manage, and administer a Drupal web site Drupal offers unparalleled flexibility for content-managed websites, and Drupal 7 is the easiest version to use yet. This newedition teaches you the fast, fun, and easy way to get started withDrupal. Even if you have no Drupal experience, you'll quickly learnhow to download and install Drupal, set up your firstcontent-managed site, apply templates, use modules, and more. Drupal gurus Lynn Beighley and Seamus Bellamy show you how totake advantage of what Drupal has to offer, make the most of thenew features in Drupal 7, and demystify perplexing Drupalissues. Drupal is a free, open source modular framework and contentmanagement system designed for content-managed web sites Shows you how to download Drupal; no programming experiencerequired Looks at Drupal 7 and explains new features that make it iseasier to use than previous iterations of Drupal for a creating ablog, content site, or eBusiness site Explains how to organize and create your site's content, applytemplates, and get your first site up and running Details the ways to use modules and third-party templates Whether you're looking to implement a flexible contentmanagement system, turbocharge a blog with photo galleries, oradminister a third-party Drupal site, this book gets you off to arunning start!